It's been 30 years since Anna Wintour first took the helm at American Vogue, inspiring countless fashion lovers with each and every issue. But while I love her bold cover choices and expert eye for editorials, I especially revel in her personal style choices. Whenever fashion month rolls around, I zero in on what Wintour wears and take plenty of mental notes—can you blame me? Since she's been in the public eye for three decades, it's only natural that her style has evolved over the years. Looking back through old photos, I realized that there were a few key looks that Wintour has completely erased from her modern closet. For instance, have you seen Wintour in head-to-toe, unembellished black pieces anytime recently? Didn't think so. She prefers her signature colorful prints nearly 365 days a year these days. 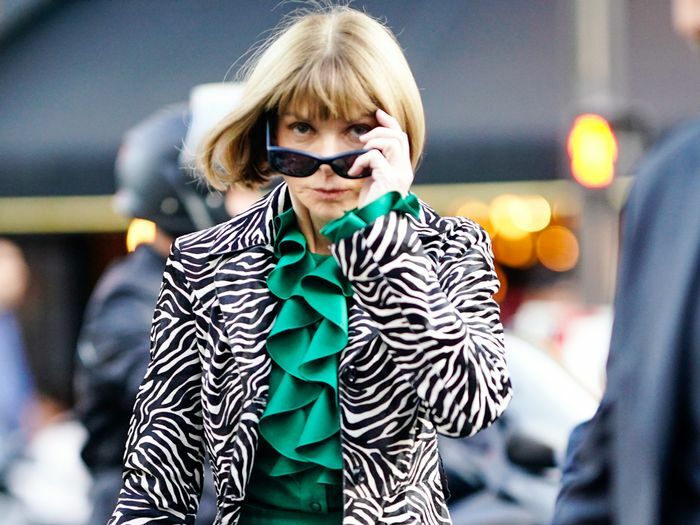 Scroll down to see four trends Wintour doesn't wear anymore and what she's replaced them with.